You may have noticed (and I’m now pointing it out for those who didn’t) that I recently added a new image to my blog header, with a spiffy little icon & my blog’s (new) name in nice big green letters. You may also have noticed my new avatar in G+ and a couple other places, my old alien monster critter but pepped up, sandwiched by my new site name. All this is happening because I know such awesome people. My talented friend Ashton (who could probably build a rocketship if he felt like it, or more likely code a robot to build a rocketship for him) did a bunch of back-end fixing of things & adding of things to make my blog way more functional, which for him was super easy stuff & for me was an impossible nightmare. Ashton fixed everything up in a few blinks of an eye, then went back to coding rocket-building robots in his spare time. 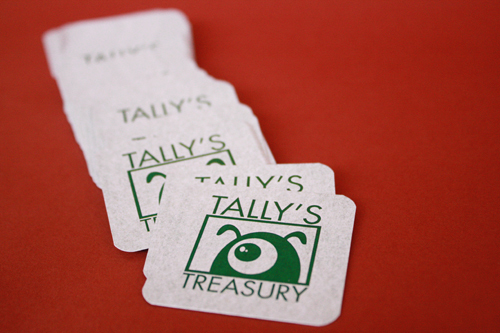 Then shortly after that, my friend Matt approached me with an idea for new Tally’s Treasury business cards, right about the time I was thinking about how I really needed to get some new business cards. Matt is not only highly talented and experienced in the ways of graphic design, he’s also incredibly prompt and communicative and was wonderfully responsive to my numerous finicky little “change this eeeeever so slightly” requests. He didn’t threaten to strangle me even once, which was pretty awesome of him. And he had this really cool design idea! He came up with the new logo, using bits of my old one, and worked with me to get it just right (do you know how many slightly different shades of green there are?! 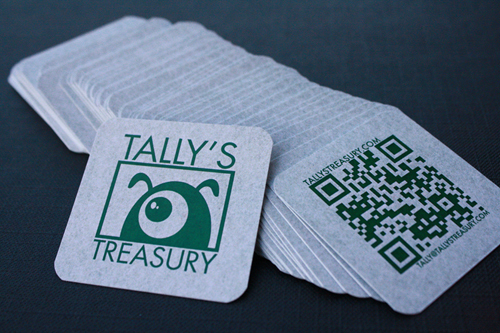 ), and easily handled my request to incorporate a QR code. 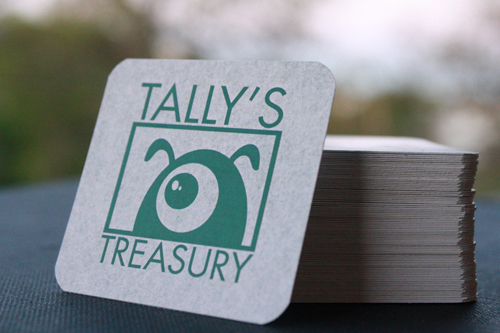 I like having unconventionally shaped business cards, so Matt had the idea of doing square cards with rounded corners, which we both thought would look super cute. 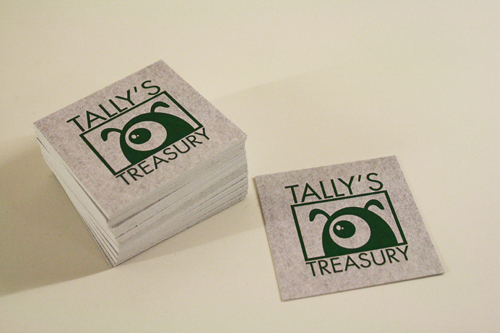 I got a quite reasonable estimate from the print shop for such a job, so we went ahead with the design – new logo, new name in carefully chosen font, QR code, site url & email address, and Matt even put a felt-like texture to the background, to give the cards a sort of textile look. I absolutely love the end result. …trundled off to Michael’s (40% off coupon in hand) to buy a corner-rounding tool. So instead of an extra $60, I paid $10 for the tool and a couple hours of my time to round all the corners myself. Which was actually not bad at all, as I did it while chatting with friends, and I’m the kind of person who likes to be doing something with my hands at all times anyway. Actually, I was feeling kind of guilty about not having to do any work at all for my new business cards, since my old card design required me to do all the cutting myself. So this made me feel like I contributed something to the creation of the new cards after all, which was a happily satisfying thing for me. And the corner rounding really didn’t take all that long. So now I have a gorgeous new stack of business cards to give out! Many thanks to Matt, who apart from being a talented designer also writes stories, takes gorgeous photographs, is super supportive of artsy, craftsy, and geeky stuff and is generally a very cool guy. He’s written his own blog post detailing the process of making these cards, which you can read here. 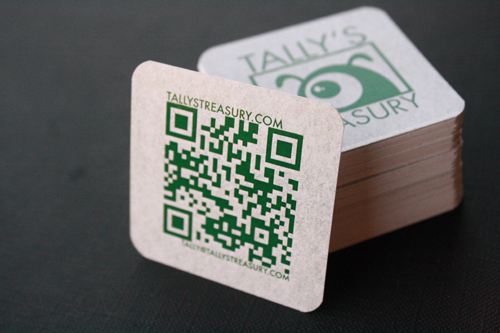 And now, more pictures of my preeeeetty new business cards. 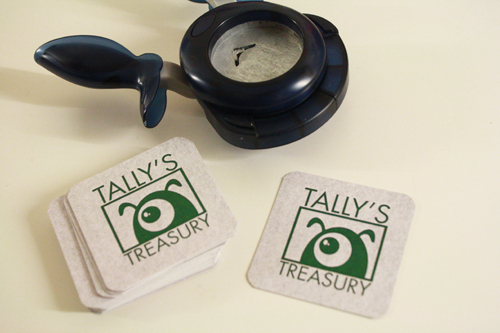 If you want one, you can find me in person and ask intelligent questions about my blog and crafting obsession until I say “Why here, let me give you my card,” or you can visit my Etsy store and receive one of my stellar, hand-corner-rounded business cards with the purchase of any item. 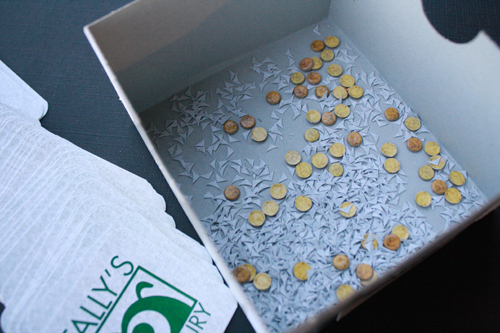 From all that corner-rounding, I also ended up with a box of paper bits (look, it’s all the corners I’ve cut… get it? Ha! ), plus leftover bits from the punch-out pieces of a new board game we tried out with our friends that same evening. It’s sort of like a box of weird confetti. With sharp corners. I’m thinking of saving it in case I ever have a nemesis, and then I’ll send them this box of sharp confetti… with added glitter. In an exploding envelope. Which is pretty much the most evil thing you can send someone, I think, unless you wrapped it up in a dead kitten or something. Which of course I would never do, because that’s the fastest way I can think of to end up with the entire internet on your doorstep, frothing at the mouth and calling for your head on a stick, which is the last thing you need when you’re busy trying to outsmart your nemesis. So actually the key would be to trick your nemesis into mailing someone a dead kitten, so then they’d wind up with the entire internet rioting on their doorstep, and you’d be left in peace to scheme. Great cards, I have to say! Nice design and execution is perfect! One question – I’d love to have that corner-rounding tool but cannot find it anywhere on the net. Would you mind sending me a link? I got the corner rounding tool at Michaels craft store (which has locations across the US and Canada). 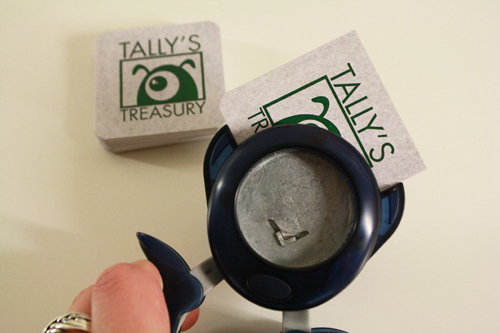 I expect you could find one at Hobby Lobby too, or a lot of scrapbooking supply stores. Here are links to the particular tool (Fiskars brand) that I bought, which comes in a couple different sizes (the one I used was the smaller, 1/4 inch rounder). being developed to allow people to create Web pages on virtually any topic.